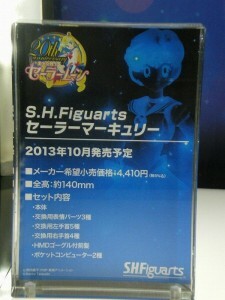 The Sailor Mercury S. H. Figuarts figure has been revealed at Tokyo International Toy Show 2013. We previously only got a look at the grey prototype figure so it’s a real treat to finally see what the completed figure will look like. Along with this better look at the figure we also get a bit more information about it from the display, none of which is terribly surprising. The price will be 4410 yen, which is about $47 US and it is 140mm (5.5″) tall. This is the exact same price and size of the Sailor Moon S. H. Figuarts figure. The figure will be released in October of this year. 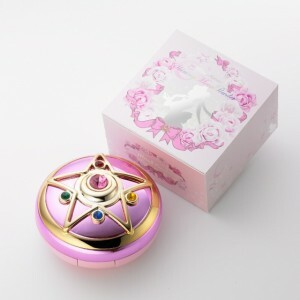 Yet another Sailor Moon make up accessory is now up for pre-order from Bandai and Creer Beaute. 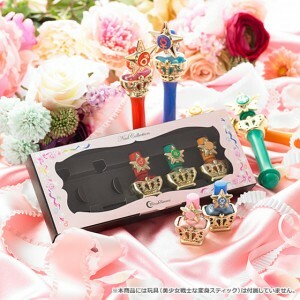 The “Sailor Moon R Miracle Romance Nail Collection” is a set of nail polishes that come in bottles that resemble the tops of the Star Power Sticks, the transformation items used in Sailor Moon R. These aren’t as convincing cosplay items as Bandai’s Crystal Star Brooch because the bottles do not resemble the entire items but rather just the tops. Though five of these bottles exist there were only four Star Power Sticks in Sailor Moon R. Sailor Moon transformed with her Crystal Star Brooch but a pink bottle similar to the others is done in Sailor Moon’s style. This item was announced on the official Sailor Moon site and will be released in October for a price of 5250 yen, which is about $55 US. For now Japanese collectors can pre-order this set from this page, but these pre-orders sell out quickly! There are no sites currently offering this item to international collectors. Pre-orders are being limited to two per purchaser and so other retailers aren’t able to make bulk orders. If this set becomes available through some other means we will be sure to let you know. 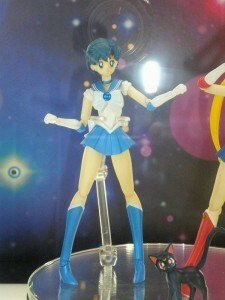 Source: Sailor Moon Collectibles and Moon Chase! Another shirt a day site, TeeFury, has a Sailor Moon inspired t-shirt, or at least one that is partially Sailor Moon inspired. 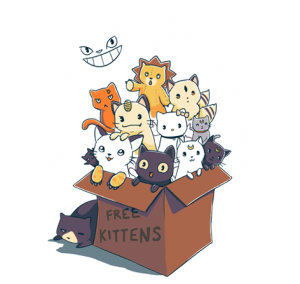 This “Free Kittens” shirt includes a ton of anime cats including Sailor Moon’s own Luna, Artemis and Diana. The shirt is $11 for one day only, June 11th 2013. Also included on the shirt are, and forgive me if I get any of these wrong, the Cheshire Cat, Kon, Kirara, Meowth, Hello Kitty, Gatomon and four cats that aren’t familiar to me. The shirt’s artist is ramyb who also runs the t-shirt site Tee Turtle which has a lot of great designs. 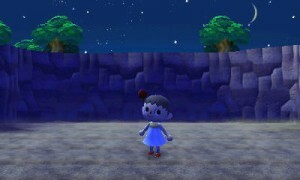 Animal Crossing: New Leaf was released today to US audiences. 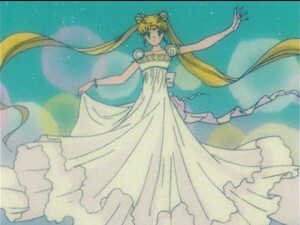 As the fourth game in the series this one has even more costumes and accessories than ever before including an item called the “Palatial Tank Dress” which looks suspiciously like Princess Serenity’s dress from Sailor Moon. Apologies for my simply dressed character. 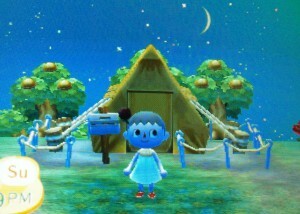 As the game just came out today I do not yet have the ability to style my hair or deck myself in the appropriate accessories that would be fitting of a princess but I was lucky enough to find this dress in the store on the first day. Just looking at the dress, do you think this reference is intentional or a coincidence? June 12th 2013 Update: This item is no longer available on J-List’s store. 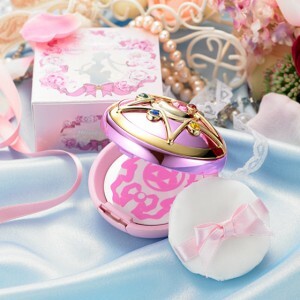 The “Sailor Moon R Moon Miracle Romance Shining Powder” compact that Bandai is putting out is hard to come by! Pre-orders sold out almost immediately in Japan. For now the item is available, for a premium, from the online store J-List. This item is being sold for $70, while the Japanese MSRP is the equivalent of $41, so there’s quite a bit of overhead here. I can’t tell you whether or not it’s worth it as only time will tell how hard this item will be to get your hands on through other stores. We’ll be sure to keep you in the loop if we find any other retailers who have this item available in the future. Japanese collectors will be able to get in on the second round of pre-orders on the 12th using this link. 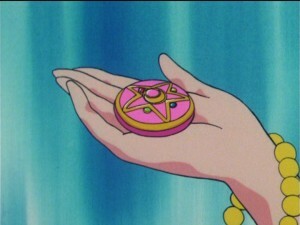 Bandai has a new toy out that will have you screaming “Moon Crystal Power, Make Up!”. 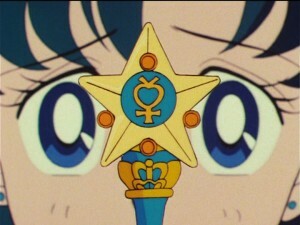 It’s Sailor Moon’s Crystal Star Brooch that she uses to transform in the Sailor Moon R series, but it’s also completely functional with make up included! It’s full convoluted Japanese name which is entirely composed of English words is the “Sailor Moon R Moon Miracle Romance Shining Powder”. The product is made by Japanese company Creer Beaute. 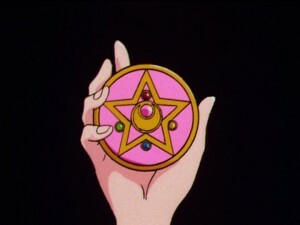 The outside of the brooch looks just like it does in the show and the inside even includes an image of the Silver Crystal and other designs seen inside the brooch during Sailor Moon’s transformation sequence. I’m not a huge make up guy but according to the official site the powder will prevent oily looking skin, has moisturizer included and is a pink glitter colour. Now if you’re caught with glitter on you, the excuse you can give to your jealous spouse can be that you were simply playing with your Sailor Moon toy. But hold that excuse until October when the toy will be released! The toy will be 3980 yen which is about $41 American. 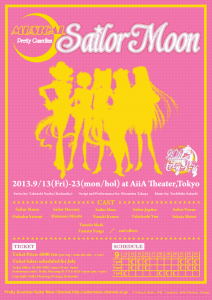 A new Sailor Moon stage musical will be playing in Japan this September. Miss Dream bring us many details of this event with their translations of Fumio Osano’s Tweets and various flyers. Japanese readers can see the announcement on the official Sailor Moon site. We’ve got dates, preorder details and cast information. 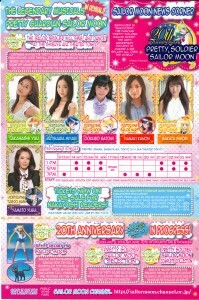 This Sailor Moon Musical, which is referred to as SeraMyu by some fans, will be playing over a 10 day period, running from September 13th to the 23rd. Tickets will be on sale starting in July by phone but can already be purchased online through this link. From the description in the flyer in Nakayoshi we learn that this musical will be a retelling of the story of the fight against the Dark Kingdom, which covers the first manga story and first season of the anime. We already have the main cast with Satomi Ookubo as Sailor Moon, Miyabi Matsuura as Sailor Mercury, Kanon Nanaki as Sailor Mars, Yu Takahashi as Sailor Jupiter, Shiori Sakata as Sailor Venus and Yūga Yamato as Tuxedo Mask. Indeed, Tuxedo Mask will be played by a woman in this musical. Check out a picture of all of the cast members below. What do you think of their likeness?